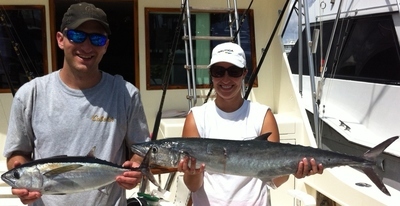 The weather continues to be on most days less than perfect but that didn?t stop Mathew and Amber from their Ft. Lauderdale fishing trip aboard Marlin My Darlin. And everything turned out OK as the rain stayed away and a pleasant day was in store as hoped. Amber?s dad fishes with us here @ All-Inclusive Sportfishing and set this fishing charter up far in advance for Amber and Matthew as a honeymoon present. Partly cloudy but a lot of sun today with seas running less than the three feet in the weather forecast. A nice breeze off the ocean helped keep us it cool despite that Florida September sun. It?s nice to see that sun for the better part of any day lately as Mother Nature sure has been keeping every thing green. Fishing today was exactly as expected for this time of year with Kingfish and those Bonito still in our area and providing that strong fight they are known for. Barracudas continue to range off the reefs and into deeper water and jump on our baits when we are actually hoping for a Wahoo. There are some Blackfin Tunas out there off the edge as expected and they while not typically of much size they bend the rods as well. Live baiting remains slow so we continue to troll to cover area in hopes of locating areas holding fish. Two deep planer lines and an assortment of baits on the surface gets the most action for our charters. Maui-Mahi remain small and almost all are undersized and we toss them back. Tilefish and Vermillion Snappers are biting on the bottom with spots north of our inlet being best when the current isn?t too strong.